Japanese Language Guide to Rugby World Cup 2019! Do I need a Visa…? What to Expect from the Match/Japanese Culture? How different is a Japanese Rugby Match? What can I order/get at the Games? With the Official Rugby World Cup 2019 not too far away from us, we have compiled a list of things that’ll help you get ready for your stay in Japan! This includes information related to the stadiums, how to get there as well as a few hotel chains that you should be on the lookout for during your stay. And let’s not forget, all the goodies we can typically get at a sports match held in a stadium! Don’t worry, we’ll also cover some Japanese words and vocabulary that can definitely come in handy for you when you’re here in Japan. With that out of the way, let’s first take a look at the various stadiums across Japan at which the matches would be held. With there being so many stadiums to cover, we will only be taking at the two main stadiums at which the Opening Match and Final Match would be held. 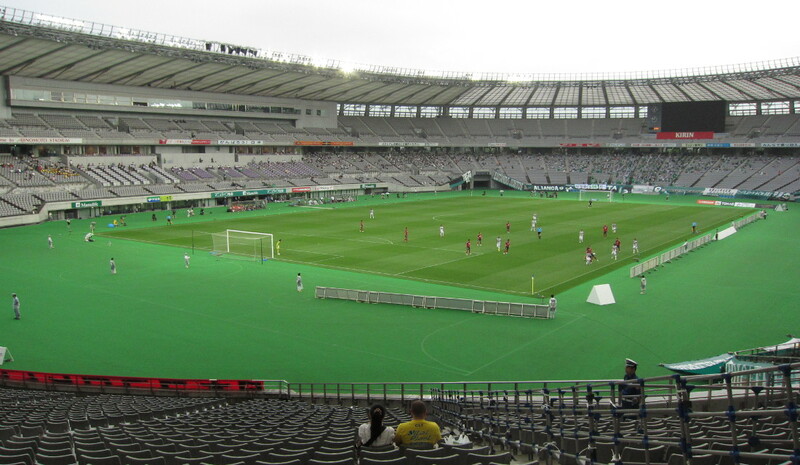 For the Opening Match, it would mainly take place at Ajinomoto Stadium (味の素スタジアム, Ajinomoto Sutajiamu), also known as the Tokyo Stadium. And as its name suggests, it’s located in none other than Chufo City which is within the Tokyo Prefecture. This Stadium can hold up to 49,970 people at its maximum capacity, making it relatively huge. Nevertheless, it’s still smaller than Tokyo Dome’s capacity of 55,000 people. Looking at the name, it does sound interesting, doesn’t it? Since Ajinomoto (味の素, あじのもと) is typically associated with Mono Sodium Glutamate (MSG), a type of seasoning used in a wide variety of Asian dishes. The Matches would be held from September 20, 2019 up until November 2, 2019. Below is a Summarised Timetable indicating the Date, Match Details, Starting Time as well as the Venues. Do keep these dates in mind and mark them down on your calendars before heading off to Japan! As the Payment Deadline for the First Official Tickets has already been over, the only chance of getting your tickets now would be through Authorized Re-sellers or the Second Official Ticket Sales, of which would begin on 19 January 2019. However, conduct a thorough check on the background of the company you are buying the tickets from. Compare the prices with that of other companies as well in order to prevent yourself from running into Scalpers. There is also a List of Websites you can find here which indicate the websites of which the tickets sold would be rendered unusable. If you are intending to get the Tickets through the Second Official Ticket Sales, however, head down here find out more about how to go about creating a Ticketing Account. For more information on the Ticketing Procedure, you can head down here! As the event is only held from 20 November 2019 to 2 November 2019, this event spans for only 43 days. Therefore, you would not need a Visa. However, should you fall under any categories of these Nationalities, you may need to apply for them as soon as possible. This would definitely help smoothen out the process and that you would receive your Visa just in time for you to spectate the Rugby World Cup 2019. If you’d like to find out more about the generally required documents for visa application, you can check it out over here. Catching both the Opening and Final matches? Well, you’d definitely want to settle your accommodation first! Here are a few accommodation options in Tokyo that you can consider taking a look at! You can find out more about their hotel locations over here. You can find out more about their hotel here. Besides Super Hotel, there are also some other notable Hotel Chains you can find in Tokyo also include Toyoko Inn as well as APA Hotel. It also goes without a saying that Airbnb would be up on the list due to its affordability and availability. Do note, however, that you should try to get your bookings in early. If you try to book through online websites like Booking.com or Expedia, you might not be able to get yourself a room due to the high online traffic. Nevertheless, there are still some alternatives in which you can try to get a room through a travel agent. Location-wise, it could ideally be anywhere along the Fukutoshin, Namboku, Keihintohoku or Tokyu Toyo Line that enables you to link to the Yokohama Line. In this way, not only can you get to catch the spectacular opening in Tokyo but also the grand finale in Yokohama City. Other Accommodation Options can also include Ryokans which are traditional inns that you can find all across Japan. However, these can be harder to find in metropolitan cities like Tokyo, making it relatively expensive to stay in any one of these. Prices can ranges anywhere from as low as 5,000 yen a night and up to a whopping 80,000 yen a night! Nevertheless, these may typically be worth your money if your primary focus is on the complementary meals that come with your stay. These are known as Kaiseki Meals and the ingredients used can vary from time to time depending on what is in season. For more information on Ryokans, head on down to this blog post to find out more! As for Minshukus, these are mostly family-operated where you would get to stay together with locals for a period of time. This is a great opportunity for you to interact and make friends with some of the locals if that is part of your intention of coming to Japan. Prices can range anywhere from 5,000 yen up to 10,000 yen a night. However, these can be relatively hard to find and may only be found in the more outskirt regions of Tokyo. Lastly, we take a look at Capsule Hotels. These are mostly targeted at solo travelers who are just looking for a place to stay overnight. Prices can range anywhere from 2,000 yen up to a total of 6,000 yen. However, this may also relate to the number of amenities made available for you to use. These are purely meant for short-term stays and would be ideal for those who are simply looking to check in today and check out within the next week to head off to another prefecture for another match. Assuming that you are staying somewhere along Shibuya and Shinjuku, your average Travel Time to both the Ajinomoto Stadium and Nissan Stadium would be around 1 hour. Besides these 3 operators, there are also some lines owned by Private Railway Operators, of which is what connects the majority of Tokyo to its neighboring prefectures. Here are the lines of interest from the aforementioned section. Do note that changing between lines owned by different operators can make your fare just that tad bit more expensive so do plan out your routes in advance. If you are thinking about getting a day pass, here are some that you can take a look at! While at the train station, you might also hear some phrases of which you may not be familiar with. Romaji: Mamonaku, ___ ban sen ni ___ houmen yuki ga mairimasu. Abunai desukara kiiroi sen made osagari kudasai. English: The train bound for ___ at line ___ will arrive shortly. As it is dangerous, please wait behind the yellow line. 下り – Read Kudari, indicates the “Down” direction. 上り – Read Nobori, indicates the “Up” direction. In general, Gawa is used as a suffic to indicate the side of something. Here are some examples below that you can take note of! Also, the peak hours in Japan are typically between 8:00 am to 9:30 am in the morning and 5:00 pm to 8:00 pm in the evening. To avoid the rush hour and squeezing with other people, you might want to consider heading out either earlier or later than the times stipulated above. Romaji: Koko wa doko desu ka? English: Where am I right now? Romaji: _____ ni ikitain desu ga, douyatte ikeba iidesuka? English: As I’d like to go to ___, do you know how I can get there? Romaji: _____ e wa, douyatte ikeba iidesuka? English: Do you know how I can get to ____? Romaji: ___ basu/sen de ikemasu! English: You can there using the ___ Bus/Line! Want to find out more about asking directions more in depth? Check out this blog post! Before you come to Japan, it would be good if you could start planning out your finances so that you can learn to manage it. When it comes to food, Japan definitely doesn’t come short on this aspect. Should you decide to dine out for the entire day, you would come in at around 2,000 yen a day. If you are looking to save some money, you can consider getting one-coin meals at Japanese fast food chains like Matsuya, Sukiya or Yoshinoya. This would put you in at around 1,500 yen a day. Across the span of 43 days, this would put you at around 75,250 yen for the entire trip. Taking a look at Travel and Transport expenses, a one-way Shinkansen ticket from Narita International Airport to Tokyo would typically cost around 2,000 yen. As for traveling within and out of Tokyo, this would put you at approximately 15,000 yen for the entire 43 days. A typical round-trip flight from the States to Tokyo would also cost around 112,000 yen after including airline taxes. In total, you’d spend approximately 131,000 yen for the entire 43 days on traveling and transport. Should you decide to settle down on a Hotel Chain in Tokyo, you’d spend approximately 10,000 yen per Night. For a total of 43 days, you’d spend approximately 420,000 yen on accommodation. Looking for an apartment may be cheaper, however, but most landlords typically do not lease out apartments to people who are staying for short periods. As such, budget hotels would be the next best option you can only turn to. Below is a Currency Converter of which you can use to see how much you would need local currency (from YOUR country) you would need to bring for your trip. In Japan, ordering food might sometimes require you to know how to read or understand some Japanese. However, most restaurants do still put up English Menus and also some Pictures. Do also take note that, however, tipping is not a common practice in Japan and that it might even come across as offensive for some. With that out of the way, let’s get on to learning how to order food at a Japanese restaurant! Romaji: Nanmei sama desu ka? English: How many of you are there? English: There is/are ___ person/people. Romaji: Eigo no me nyuu, arimasu ka? English: Do you have an English Menu? English: I would like to have ___ of this. Waiter: Ijou de yoroshii desu ka? Customer: Yes, that is all. English: Thank you for the meal! Want to know more about ordering at a restaurant? Head on down over here! Ever heard of the word ノーサイド (Noo Saido)? This is a 外来語 (Gai Rai Go), which means it is of a foreign origin and is based on the English words “No Side”. Despite it being a loanword, it’s a mentality that’s more predominantly practiced by the Japanese during sporting events and less so of overseas. As mentioned earlier, we can recall that the Japanese are all about respect. The concept of “No Side” can even be extended into sports and particularly, Rugby matches. In this case, the word “No Side” would typically be used to indicate that a match has ended and that neither is there a losing nor winning side. It’s all about respecting your opponents and who you are up against. Without an opponent, the match wouldn’t even have been possible. At the end of the day, the end goal is really just for both parties to enjoy the fruits of their hard work and effort by giving their best in a match. English Translation: Please do not be of inconvenience to the next person (using this thing/place). As we can see, Japanese people are all about being courteous. They would even go to the extent of being considerate towards the next user, of whom they wouldn’t even know! Well, that just goes to show how nice the Japanese people are in general but that’s beside the point. Just keep this in mind, avoid littering at all cost after a Japanese Rugby Match if you don’t want to come across as an inconsiderate person. Even if you are having troubles finding a bin, just hold onto it until you can find a trash can nearby. Psst… There are plenty of Convenience Stores located all across Japan. Of which, most of them would typically have bins for you to throw your trash in! Ever wondered why the Japanese are ever so polite especially in the Service Industry? Well, it definitely has to be attributed to the concept of Omotenashi. This can be observed from the fact that most Japanese service providers would more often than not address their customers with a “~様 (Sama)” Suffix to show respect. Either that or would they use the Honorific Prefixes of お (O) and ご(Go) to mention nouns in a more polite manner. The word itself stems from the word 表 (Omote) and なし (Nashi). Of which, the former refers to the surface of which the server WANTS to be presented to customers. As for the latter, it refers to “Not Having ___”. When put together, this becomes the concept of Omotenashi as we know of today, which would be to put aside your pride and ego (How your SURFACE is being presented) so as to serve your customer to the fullest. Another way to write and dissect it would be as “お持て成し”. The word “持つ” (Motsu) refers to “Hold” or “To take Charge of” whereas the word “成し” (Nashi), refers to having accomplished something. So when you have someone under your care, serve them to the fullest by providing excellent customer service, only then would you be able to accomplish the end-goal of providing Omotenashi. Want to find out more about Omtoenashi? Why not check out this blog post! In Japan, Japanese is still the predominant language being spoken here. Although English is being taught across most schools in Japan, pronunciation may still prove to be quite an issue for the Japanese themselves. This may, in turn, make it relatively difficult for foreign tourists to understand. As such, picking up a few Japanese words here and there before you come to Japan can definitely make the experience here a lot more pleasant Nevertheless, with the advancement of technology, we would say that Google Translate or any other Translation tool might be your next best friend. This can definitely help you in trying to get your point across or trying to understand what the other party may be trying to say. New Year's Resolution: Getting Started on Learning Japanese in 2019...?